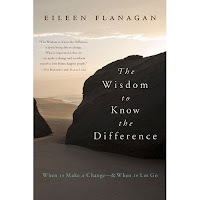 Flanagan, a leader in the Quaker community, examines the questions that many of us ask ourselves -- when is enough, enough? When do I let go? When do I hold on? How do I figure this out? Then gives the reader tools and suggestions to achieve a happier life. The book is divided into seven sections: the courage to question, knowing yourself, seeking divine wisdom, shifting your perspective, practice loving acceptances, letting go of outcomes, and finding wisdom in communities. Throughout these chapters, the authors own story is interwoven with the stories of others. Each section ends with queries, questions that you can ask yourself about your life and your story in order to decide what can be changed and what can't be changed. In the spirit of being completely honest, I really wanted to be able to embrace this book and its teachings, but in the end, I couldn't. I hold the serenity prayer and the philosophies very close to my heart, my blog name itself comes from the prayer. I seem to be on a never ending quest to "know the difference" and finding the courage to know what I can and cannot change. Many of the stories in the book were tales that I just wasn't able to relate too. I felt as if I was missing a connection because there were too many stories jumbled together to prove a point. The book is approached from a religious standpoint which conflicts a little with my own personal line of thinking-- trust your God who will guide you to the right answer for you. I fully respect this, but from my own personal journey to "know the difference" I've found that the answers come from within me not an outside source. I need to trust myself and search for those answers internally. While the book does provide some great questions to ponder, wading through the rest of the stories was a sometimes arduous task.